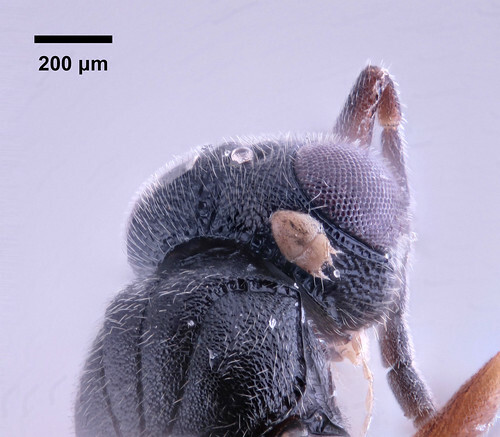 Ceraphronoidea is a superfamily of parasitoid wasps that occurs worldwide, yet little is known about the life history of this group. The superfamily includes both ecto- and endoparasitoids, sometimes within the same genus (e.g. Dendrocerus)1,2,3. Though ceraphronoids have been reported as parasitoids of at least nine different orders of insects 3–9, there are no reported parasites or parasitoids of any ceraphronoids to date. There is very little known about how ceraphronoids even interact with invertebrates other than their hosts. While photographing specimens at the National Museum of Natural History (USNM) in Washington, D.C., I found a tiny mite clinging to the metasoma of the type specimen of Ceraphron carinatus. I found a similar mite on the metasoma of another type specimen, Conostigmus schwarzi. Female type specimen of Ceraphron carinatus at the National Museum of Natural History (USNM) in Washington D.C., USA, with an astigmatid mite attached to the metasoma. Photo by Carolyn Trietsch (CC BY 2.0). Click for source. Dr. Skvarla referred me to Astigmata specialist Dr. Barry O’Connor, Professor & Curator of Insects and Arachnids at the University of Michigan. Dr. O’Connor recognized the mites as deutonymphs in the family Acaridae. As mites mature from larvae to adult, they go through three nymph stages—protonymph, deutonymph and tritonymph. What are these mites, and what do they do? Do these mites feed upon the wasps, much in the same way that ticks feed upon deer and humans? While there are a few highly specialized parasites in the group, most acarids are actually fungivores or detritovores. In many Astigmata, the deutonymph life stage actually lacks mouth parts and cannot feed. Instead, these deutonymphs are phoretic. Phoresy is a type of symbiotic interaction between different species, where the phoront or symbiont relies on a host to transport it from one place to another. 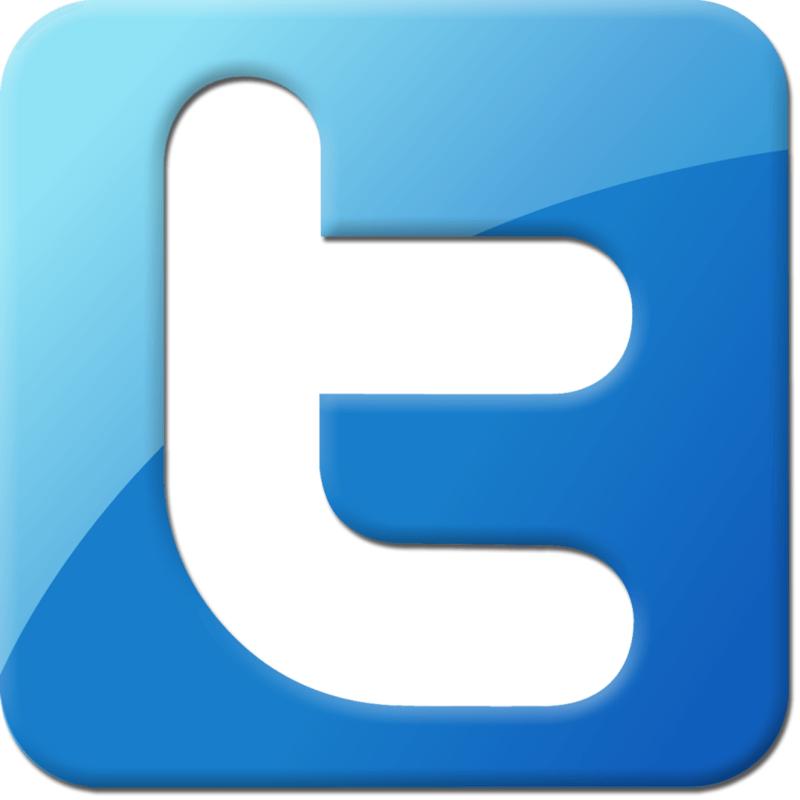 It is a commensal type of relationship in that it benefits the mite and does not harm the wasp. 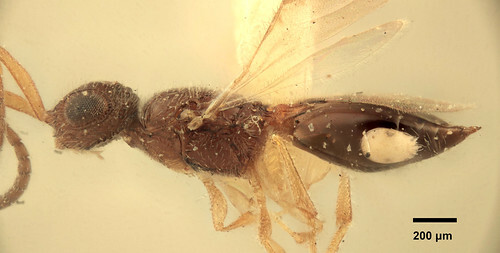 Female type specimen of Conostigmus schwarzi at the National Museum of Natural History (USNM) in Washington D.C., USA, with an astigmatid mite attached to the metasoma. Photo by Carolyn Trietsch (CC BY 2.0). Click for source. In Astigmata, the phoretic deutonymph stage is specialized for dispersal. These deutonymphs are nothing more than hitchhikers, catching a ride on the wasps to move between different habitat patches. Some deutonymphs are generalists in that they are found on many different types of insects, but others are specialists and rely on certain insects to transport them to certain areas or hosts. Unfortunately, we aren’t sure what insects Ceraphron carinatus or Conostigmus schwarzi parasitize or what their natural histories are, making it difficult to determine where they picked up these deutonymphs or where they may transport them. While looking through European specimens recently, I discovered another mite on the back of the head of a Conostigmus female. Dr. O’Connor identified it as another astigmatid deutonymph, possibly belonging to the family Hemisarcoptidae or Winterschmidtiidae. According to Dr. O’Connor, some hemisarcoptids and winterschmidtiids are generalist phoretics. Conostigmus sp. 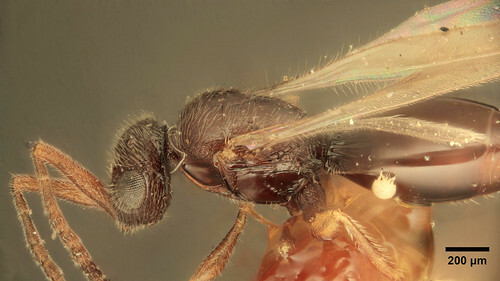 female from Europe, with an astigmatid mite attached to the back of the head. Photo by Carolyn Trietsch (CC BY 2.0). Click for source. Special thanks to Dr. Mike Skvarla and Dr. Barry O’Connor for their help! 7 Dessart P (1992) Revision d’Aphanogmus fulmeki Szelényi, 1940 (Hymenoptera, Ceraphronoidea, Ceraphronidae) avec remarques biologiques. Bulletin de l’Institute Royal des Sciences Naturelles de Belgique 62: 83–91. 8 Goulet H, Huber JT (1993) Hymenoptera of the world: an identification guide to families. Research Branch, Agriculture Canada.